NASA Curiosity rover has returned major discoveries in the search for life on Mars. Two new papers published Thursday in the journal Science reveal the rover found evidence that carbon-based life existed long-ago on Mars and, in a separate discovery, returned significant evidence relating to the search for current life on Mars. Michelle Thaller, assistant director of science for communications at NASA's Planetary Science Division, led a press conference announcing the discoveries by making sure people understood that NASA has not discovered life on Mars. It has, however, discovered "tough" organic molecules in a lake bed and varying levels of methane in the atmosphere that change with the seasons. "With these new findings, Mars is telling us to stay the course and keep searching for evidence of life," said Thomas Zurbuchen, associate administrator for the Science Mission Directorate at NASA Headquarters, in a statement. "I’m confident that our ongoing and planned missions will unlock even more breathtaking discoveries on the Red Planet." What did NASA find on Mars? 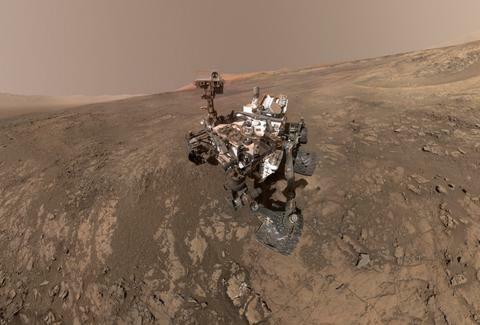 The data coming back from the Curiosity rover reveals that the lake that previously filled the planet's Gale Crater -- where Curiosity landed back in 2012 -- contained complex organic molecule at one point. Though, it wasn't recent. It was likely somewhere around 3.5 billion years ago. The organic molecules contain carbon and hydrogen, and "also may include oxygen, nitrogen, and other elements," NASA said in the announcement. These are the building blocks of life. However, they can be yielded through non-biological processes as well, so it's not hard evidence of life. Even if it's not the hard evidence many are hoping for, it's a major discovery and will guide NASA's ongoing exploration of the fourth planet from the sun. "This is an important finding," says Samuel Kounaves, a Tufts University chemist and former lead scientist for NASA's Phoenix Mars lander. "There are locations, especially subsurface, where organic molecules are well-preserved." Additionally, the organization announced that the planet has been found to have seasonal variations in methane levels. Scientists had previously seen giant plumes of methane on the planet. The rover has been sniffing the air to collect samples and make sense of the shifting methane content. It's a curious discovery because methane only survives for a few hundred years at a time, writes National Geographic. 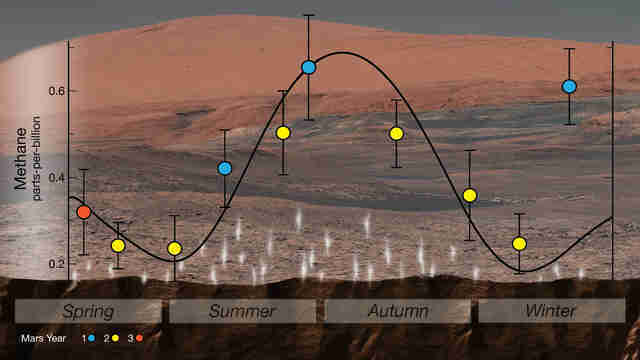 There's something on Mars that is creating methane. "It’s a gas in the atmosphere of Mars that really shouldn’t be there," says Chris Webster of NASA's JPL and lead author of the paper on methane in the Martian atmosphere. In a release, NASA notes that "water-rock chemistry might have generated the methane, but scientists cannot rule out the possibility of biological origins." Similar to the discovery of organic molecules, it's evidence that could point toward life, but it isn't definitive. "This is the first time we've seen something repeatable in the methane story, so it offers us a handle in understanding it," said Webster. "This is all possible because of Curiosity's longevity. The long duration has allowed us to see the patterns in this seasonal 'breathing.'" Webster's team says the methane may come from deep underground and seasonal temperature shifts throttle its ability to reach the surface. As Curiosity continues to collect information on the Martian surface, the data gives confidence to scientists working on other Mars-related projects like NASA's Mars 2020 rover and the European Space Agency's ExoMars rover, slated to touch down on the planet's surface in 2021.